The 442 was a package originally introduced on the 1964 Oldsmobile Cutlass and F-85. The name represented the original car’s four-barrel carburetor, four-speed manual transmission and dual exhausts. It remained an option on these cars through 1967 and in 1968 it became a standalone model that shared the same general style as the Cutlass. 1970 was the best year for Olds and their star muscle car, the 442. The engines were huge: this car has a massive 7.5-liter V-8 stuffed under the hood and it also carries the optional W-30 package which bumped the power to 370 horsepower (and 500 lb-ft of torque). It’s a monster and one the best performance cars GM had made up to that point. In 1972, the 442 was demoted to an appearance package you could order for your Cutlass. The 442 was a short-lived muscle car icon and this car, with that W-30 package, was the most badass Oldsmobile you could buy. Only 262 W-30 Sport Coupes were made in 1970 and this is one of just 120 with an automatic transmission and air conditioning. It’s well-optioned and very nicely restored. And that green and white paint scheme is a great combo. This is a $100,000+ car and you can read more about it here. Click here for more from Mecum in L.A.
Update: Not sold, high bid of $50,000. 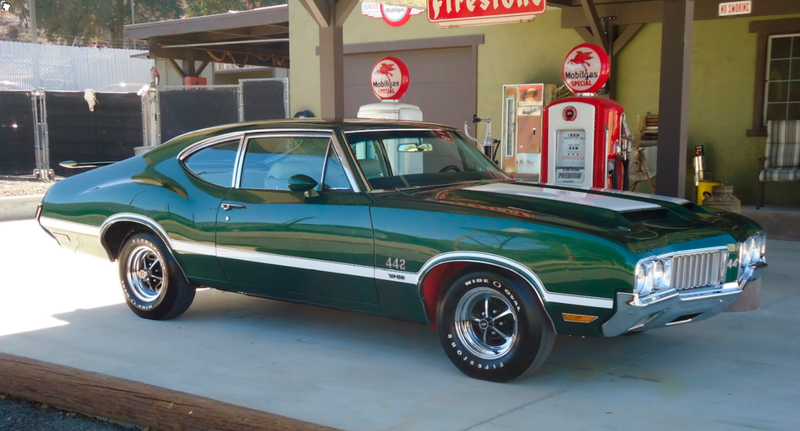 This entry was posted in Uncategorized and tagged 1970, 442, auctions, cars, classic cars, mecum, muscle cars, oldsmobile, w-30 by classiccarweekly. Bookmark the permalink.